Before we get to the tl;dr version, here is a quick synopsis. Langstroth screened bottom boards sounded useful. We had Annabelle built with a mesh floor. It only proved a pain in the sit-upon. We now doubt its actual utility, at least in horizontal hives. Beatrix was built without one. We floored over it in Annabelle. And now the bloviation. 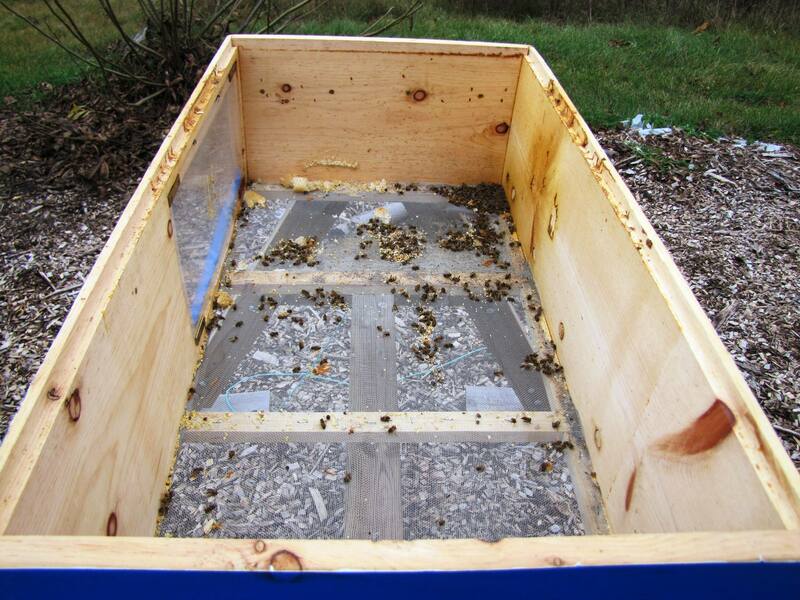 As we were researching hive designs we came upon mention of screened bottom boards. The Langstroth bottom board is essentially three short walls that hold a floorboard about midway up. Thus if the bottom board is placed directly on the ground the floor itself is not in contact with it and the missing fourth wall creates the hive’s entrance slot. The floor has traditionally been solid (as in the picture) until the advent of the infamous varroa mite. These pests ride on the honeybees sucking hemolyph (the fluid which serves the bees as blood), spreading various viruses, and darting into a brood cell just before capping to lay mite eggs. On occasion they fall off or are pulled off by some bees to fall to the floor, from which they climb upon a passing bee and are once more up in the comb waiting for a chance to lay. In a screened bottom board (SBB) (picture at the link) the floorboard is not solid but a mesh fine enough for the bees to walk upon yet coarse enough for mites to easily pass through. Any mites that fall have a good chance of falling to the ground and a more difficult time climbing back aboard a bee. Having the bottom so open to the air also provides increased ventilation, which some find beneficial. Screened bottom boards usually have a panel that can be slid under the screen to provide a solid floor. It may be installed by beekeepers when they do not wish additional ventilation, as during winter, although there are those even where winters are severe who counterintuitively leave the screened bottom board in place all year round rather than switch to a solid floor for the colder months. And the panel may be coated with something sticky or bear a sheet of sticky paper to better trap any fallen mites and allow counting them to estimate the severity of a mite infestation. 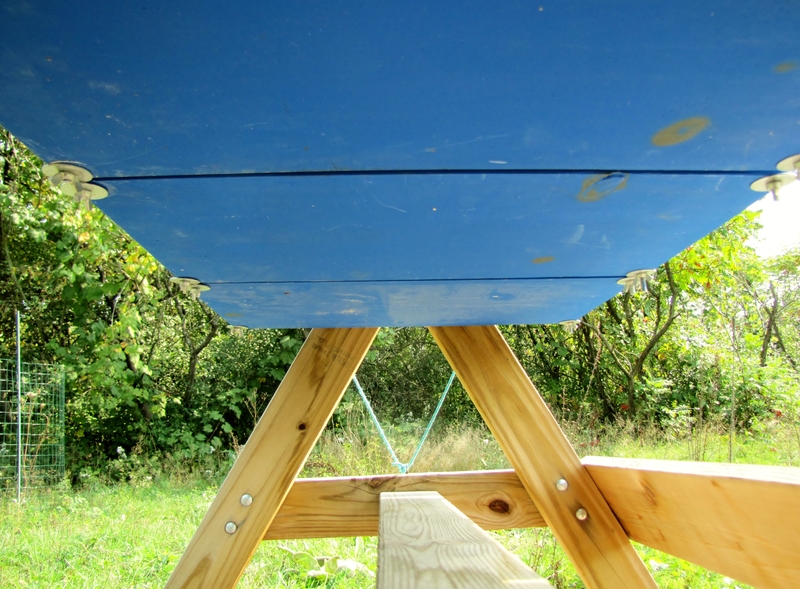 In our innocence these all sounded like good features not to be lost by running a horizontal hive, so when we commissioned Annabelle’s construction, we specified a screened false bottom with a detachable solid floor under it. We could then open up for ventilation or mite dropping and close up as we saw fit. Steller Apiaries obligingly built us such a bottom. It is a pity that the only picture we have of the screened floor is the sad one taken last year after all the bees had died. The actual solid floor was made in three sections and attached with hangar bolt and wing nut hardware, similar to the observation window. (As usual clicking on a picture will display a larger version, easier to examine for details.) The differences are that instead of holes for the bolts to pass through there are notches and the hangar bolts in the front extend further than the ones in the rear. This means that after removing the rear wing nuts we could reach under the hive from the back to merely loosen the front wing nuts, drop the floor section, and pull it back to remove it without getting in the way of the foragers coming and going at the front of the hive. Typical Keith Steller ingenuity. As it happened, we never did drop the bottom. Even if our colony had thrived, first year packages very rarely need worry about Varroa(Edited 2017-05-01. This assertion turns out to be simply false.) nor did our bees ever beard or otherwise indicate that more ventilation might be needed. Then we learned that the ventilation provided by a screened bottom board was not necessarily welcome. Bees are accustomed to maintaining the internal environment of a hive whether that is warmer or colder than the outside air. Opening up the bottom undoes all that by letting the outside in. While that may be tolerable if not actually useful when the hive is a vertical column with floor near the ground it seems foolish in a horizontal trough several feet off the ground, which would be much more affected by winds. Furthermore the space between screen and solid floor merely provided an area for bits of wax and dirt to accumulate where the bees could not reach to keep clean. We should have regularly been opening up to clean that area. Our neglect was evident after the colony had died and we finally went to clean up the hive whereupon we found wax moth cocoons in this area. The remaining possible SBB use for us was to monitor Varroa, which, had our bees survived, could have become a problem in their second year. But there are other methods such as the sugar roll. And many horizontal hives do fine with solid floors. In the end we opted to forego the additional complexity of construction and required maintenance when building Beatrix and so she has a simple, solid floor. That left Annabelle to consider for this season. We could leave her as is and do a better job of periodically cleaning the area which the bees could not access or retrofit her with a solid floor. We did the latter by simply cutting a few boards to fit and dropping them in on top of the screening, thus losing around three quarters of an inch of interior depth and hence the ability to accommodate deep Langstroth frames. But since we have so far started her colonies with packages or medium frames from a nuc, this is not a great concern.